Vinyl Installation or Viral Marketing Campaign? Taking a stroll west along Queen St. W. towards Roncesvalles Ave., I couldn't help but notice a series of storefronts with LP album-sized posters emblazoned on their front window exterior. At first I thought it was some new viral marketing campaign or advertising for a new DJ. The artwork is made of vinyl, but not quite the same type used for LPs. 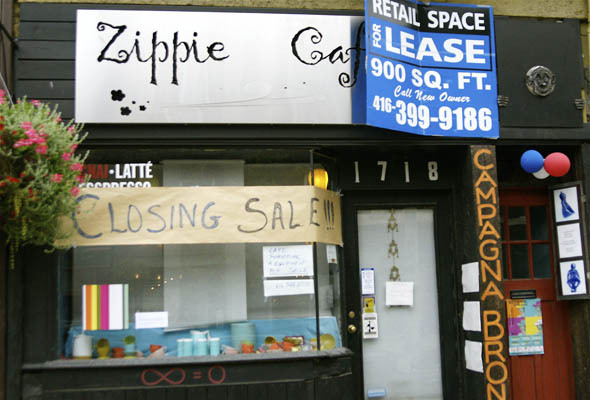 They're installed on the exterior of storefronts on the north side of Queen St. between Triller Ave. and Roncesvalles Ave. There's even one such piece of art stuck to the window of the long closed Bank of Canada building (top photo). 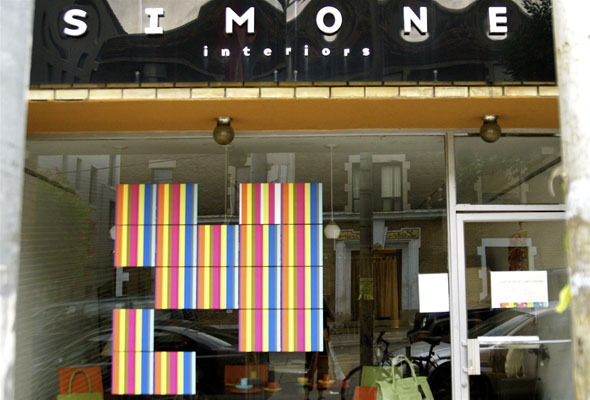 The 18 source paintings for participating businesses are displayed in the storefront window of Simone Interiors. "Individual paintings were 'customized' from the original source painting by removing the numbered stripes that coincide with the numbers in the address of the specific building." I can't for the life of me figure out how the numbering scheme works with those colourful vertical stripes. Perhaps it's the workings of some secret bar code. It kind of reminds me of the test pattern you used to see on TV after the end of regular programming. 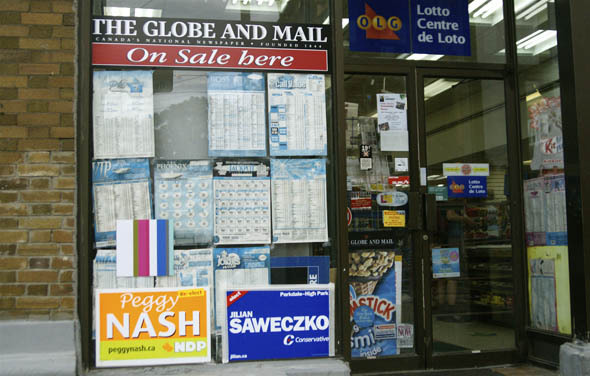 The window of the store at the corner of Queen and Roncesvalles was a jumbled mess, with the art installation piece almost hidden amongst the long-distance phone card ads and election signs. Still, a few bright stripes liven up the window. I wonder if the locals even noticed. The block-long installation will appear for two weeks.